Many modern homes have large-sized kitchen designs. While this is a great thing for holiday feasts, it can be a little overwhelming when it comes to designing a new layout for a remodel. Small kitchens tend to kind of work themselves out, with things like appliance door clearances dictating where everything needs to go. With a bigger floor plan comes more options—and more opportunities to make mistakes. Kitchen Islands are Good, But…. It’s almost a given in a large kitchen design, that you’re going to have an island or a peninsula. But how many times have you seen half of an island go unused at almost all times because of poor layout decisions? Here are some ideas to make sure your entire island is useful space in your everyday life. Common among kitchen cabinet peninsulas, but less so in an island, the far side of an island can incorporate low bar seating, or a split-level design with the far side either lower to act as a dinette table with normal chairs, or higher to act as a bar with full bar stools. Do you have someone in your family who’s really, really tall, who has to bend over to use a normal countertop? What about children, or elderly or disabled people who need a lower work area that they can reach from a wheelchair or without standing on their toes? 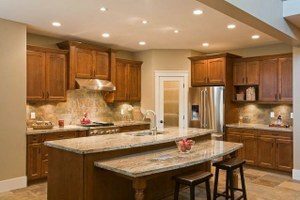 Even if you don’t, an island with staggered working surface heights can accommodate guests and make your house easy to sell should the time come. A bigger kitchen gives opportunities to play around with the standard “work triangle” layout. You do still need that for a single cook, but rather than just making one triangle bigger (which can quickly get to be too big), try setting up multiple overlapping work triangles. You can do this by having a prep sink in an island, staggered away from the main sink but still in reach of the range and fridge, maybe near the pantry. You can also split up the standard range into a separate cook top for normal cooking, with ovens under the island or another area of the counter, so one cook can be in and out of the oven for something like preparing a Thanksgiving feast, without disrupting another’s work at the cook top. Just make sure each work zone has access to four essential things: fridge, heat, sink, and counter space, all within just a few steps. Need more advice on how to set up a large kitchen? We’re happy to help! Our professionally-trained kitchen design consultants are standing by, ready for appointments. Just click here to sign up, and set up a time that’s best for you, to fine-tune your kitchen layout and figure out what you’ll need to make it happen! 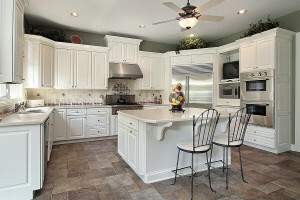 ‹ How Do I Set Up a Budget for RTA Kitchen Cabinets?